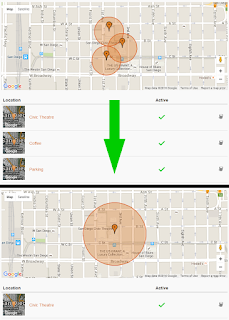 Geofences allow you to create location-based triggers around your venue. Think of it as putting a ring around your theater, concert hall, museum or other venue. When your patrons cross the geofence ring, they receive a customized message on their phone prompting them to open your mobile app. There will always be some give and take with determining a user’s location. Especially when considering all of the technologies and factors that go into it. As an example, avoid placing one Geofence around your venue, another around the parking lot next door, and a third one for the coffee shop across the street with which you have a partnership. Even if a user parks in the lot and grabs a cup of coffee across the street before heading into the event, they might end up receiving the event notification first, then one for the coffee shop, and lastly for the parking lot at which point they’re already in your lobby. 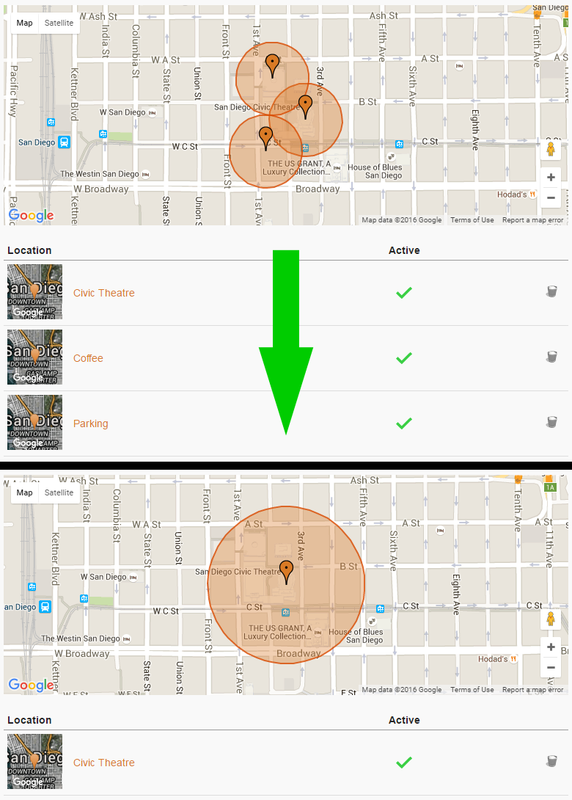 TIP: Use one Geofence to surround everything and then supply parking and coffee shop information as part of the At-The-Venue (ATV) Experience content. 2. Encompass the Entire Venue. And a Little Bit More. The size of your Geofence is important. The minimum diameter is 200 meters (or about 650 feet) which will cover most small to medium sized venues. Increase the size as needed to cover larger venues. But don’t make it too big as users who have the App might receive a message even though they are not attending the event. TIP: First, adjust your Geofence so that the entire venue is inside of it. Then expand it to add some buffer room. An extra 50 to 100 meters wouldn’t be unreasonable. A single venue is easy. Create your Geofence, set an Any Time or ATV message, and you’re done! But for our partners who present at different venues, Custom Messages are key. TIP: You can use these to create time-specific messages at each Geofence for each event. This will help you avoid sending messages to people if they happen to arrive at a location when you don’t have an event going on there. You can also mix-and-match. Setup a main Geofence with an Any Time message and Geofences for special venues with only Custom Messages. It is important to have your Geofences set up well in advance of any events taking place. If you create a new Geofence around a venue two days before an event, odds are low that patrons will have opened the App in that time. This means that their phone won’t have the latest Geofence information, they won’t receive a message when they arrive, and they won’t know to open the App to view program information. TIP: Make sure everything is set up well before your next season begins. Then, as users open the App to buy tickets or after receiving Push Notifications, Geofence information will be downloaded and they will be all set. The different kinds of Geofence messages (Any Time, At-The-Venue, and Custom) call for different approaches based on their use. TIP: Craft a message that makes sense given the context of when people will receive it. The messages associated with Geofences are delivered by our Enhanced Push Notification system. This means you have 100 characters to tell users what’s going on and what they should do. TIP: You don’t need to get too detailed with the message. 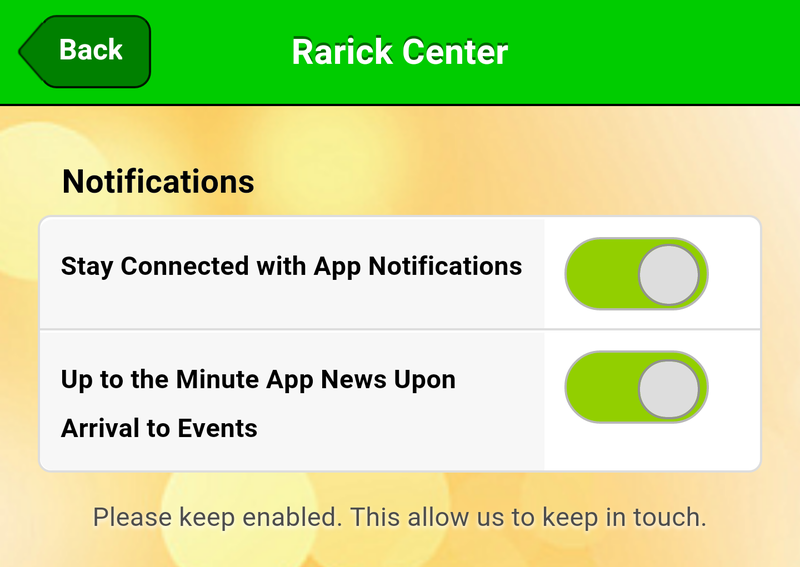 Simply make them aware that they can use the App for event information and get them to open it. From there, you can use the various ATV Experience features to tell them more. In most cases receiving a message that is just a statement isn’t very engaging; users will read it and then dismiss it. But your goal is to bring users into the App. TIP: Craft a message that encourages them to “Tap here”. It is a succinct but obvious phrase that tells the user exactly what you want them to do. 8. Get the word out! Of course, Geofences won’t do anything for people who haven’t downloaded your App. A solid adoption plan is essential for getting your App on your audience member’s phones. The biggest part of App adoption is telling people about it! TIP: Advertise your App with a SmartURL on Facebook and Twitter. Make sure it is mentioned somewhere in every email newsletter that you send. 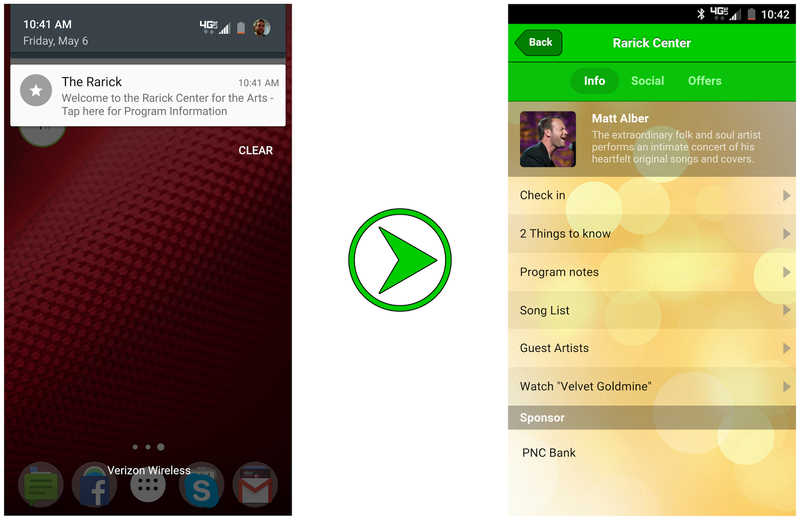 Communicate to your fans what value the App provides. Let them know it will help you keep in touch with them about important notifications and reminders. That they’ll be able to access exclusive content when they come to a performance. Or be able to find upcoming events and purchase tickets. 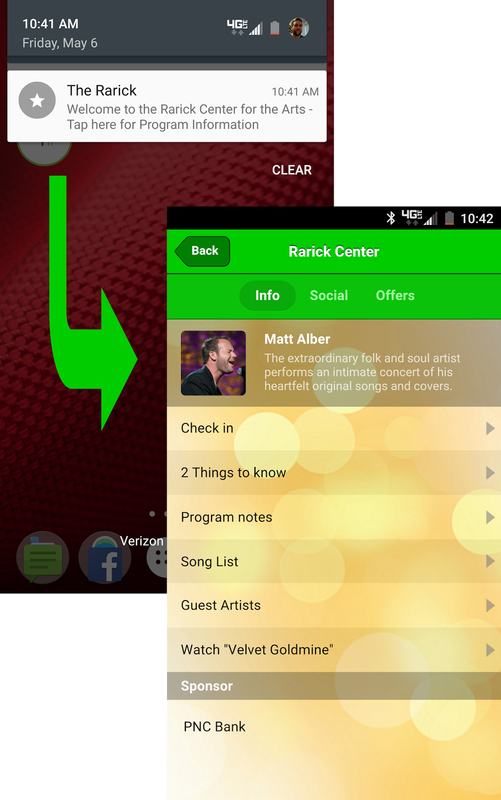 Once someone has downloaded the App, they do have the right to disable notifications. But if they disable them, then you can’t communicate with them. TIP: When promoting your App, consider reminding people that they need to have their App notifications enabled and their location services turned on to receive information and updates. This also helps manage users’ expectations so that when the App prompts them to enable notifications, it doesn’t come as a surprise. 10. GPS. Cell Towers. WiFi. There are many components to determining a user’s location. GPS signals do a lot of the work. So does pinging nearby cellular service towers. But what does WiFi have to do with Geofences? For the kind of background location awareness that this service requires, WiFi networks can be a big help. The user’s phone does not need to actually connect to the WiFi network. Just by being able to see the name of the network or networks that are available nearby, the location services of the phone can use this information to help determine where a user is. TIP: For the best experience of delivering your message at the right place and the right time, we highly recommend setting up a WiFi network if you don’t already have one. It doesn’t need to be free and open to the public, it just needs to be there.